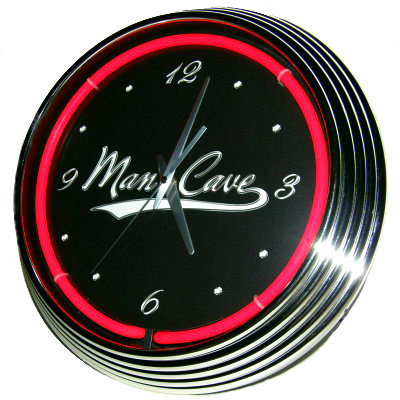 Get him a Man Cave Neon Clock that he will actually love. This handsome Man Cave Neon Clock - Red was designed specifically to enhance the masculine decor of any Man Cave, game room, office, bar area, garage or other desired male hangout. A neon wall clock like this one is ideal for birthdays, Christmas, holidays, anniversaries, retirement or other special occasion. ON CLEARANCE A MAN CAVE GIFTS Exclusive Design. © Copyright 2013 . ♦ Quiet, cool and energy-efficient. PROCESSING/SHIPPING: Approximately 1-2 business days for processing and 2-4 business days for shipping. NEED IMMEDIATELY? See IN A RUSH? See Holiday and Father's Day Shipping Schedule in May, June, November & December.